The following is a selection of “Tuidang” (Quitting the Party) statements made by Chinese nationals on July 23-24, 2013. Presently, the wave of quitting from the CCP is sweeping through China and overseas [Chinese communities]. 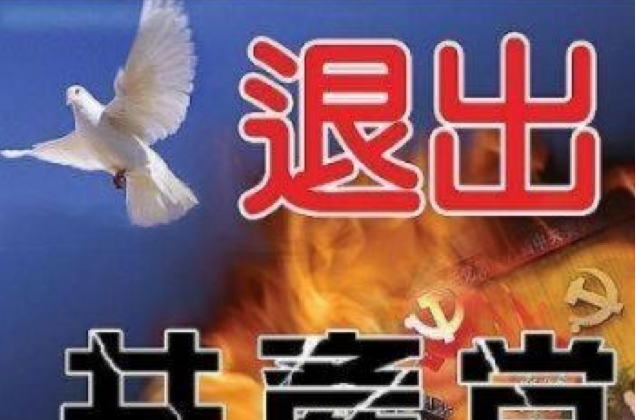 “Quitting the CCP to make it collapse” is a mandate from heaven, and it is what people are yearning for. I have long hated the CCP badly, and now I solemnly declare my withdrawal from the Young Pioneers. I draw a clear line between myself and the evil CCP and look forward to a beautiful future. In the past 20 years I was kept in the dark, nobody told me what’s truly right or wrong. At the beginning I thought foreign websites were purposefully defaming the CCP. But the horrible truth that we wouldn’t accept has gradually become apparent. Now we should not remain muddle-headed any longer, people should live with dignity. There is a saying: although I don’t agree with you, I risk my life to protect your right to speak. I joined the CCP because I wanted to protect my career. I actually have always been thinking that loving the country and loving the Party are two different things. I hate the corrupted society under this kind of dictatorship. Using servility education to lower our nations standards for the convenience to rule is doomed to fail. Many ancient dynasties were destroyed this way, and the CCP is not an exception. I hope in my lifetime to see China becoming a country that upholds the principles of truth-compassion-tolerance, people respecting each other, people becoming rational and compassionate. Since high school, I began to recognize the true face of the CCP. I love to study true history. I have felt very angry over what the CCP has done to China over the years, and I have felt very sad about the disasters the communist movements have brought to the world’s people. The tyranny of the CCP is the darkest and most horrific disaster in mankind’s history. Think about it, if the Kuomintang had won the war, Chinese people would live a much better life and definitely wouldn’t be caught in such dire straits. I hope the brutal authoritarian CCP will collapse soon. Only when it is destroyed, can there be a new China. The [communist] specter from the West is most evil, poisonous, and vicious. No human language can describe what it has done. Whoever gets associated with it will die, degenerate, and become deformed. All righteous lives have to stay away from it to keep safe. The CCP is a group of gangsters and bandits! We were the owners of our land during the Qing dynasty and during the Republic of China. But our land was taken by the CCP gangsters. They used the police to suppress, search and imprison us unarmed civilians! The gangster CCP placed itself above the nation and the law. The law here is empty and fake. They have paramount rights, but our rights are just empty words. Here I declare that I am quitting all the organizations of the evil CCP. China has an old saying: Whatever people do, heaven is watching! The carved message [“The CCP Will Collapse”] discovered in the bolder in Pingtang County says it all! I look forward to the arrival of the CCP gangsters’ judgment day! I declare that I withdraw from the Young Pioneers and the Youth League; I was forced to join these organizations. In 1949, shortly after the fall of the Republic of China, my home was plundered by the CCP. My home business was forcibly turned into a joint state-private enterprise. My grandfather was persecuted to death by the CCP. Our previously wealthy family had almost nothing left. The CCP gangsters gained power by using extremely despicable means. They then sold our national territorial sovereignty and gave away the nations profits in exchange for recognition from the international community. I want to stay away from this evil organization that harms the country and the people.